If you are a writing teacher, a young writer, a parent of a kid who loves to write, or you have any connections to writing or education or kids, this site is for you! 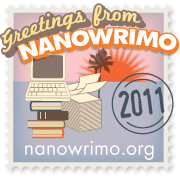 I am an English teacher who has coached 8th grade students through NaNoWriMo since 2011. This site comes out of my love for the program and the great joy I see in my students when they write with ownership and enthusiasm. If you would like to support young writers in the awesome challenge of writing a novel in a month, this site aims to guide you through the process. If this site doesn't answer all your questions, contact me here or on Twitter @LAMBradley.